This command analyzes the specified disks, directories or network shares. This command analyzes all network shares in the specified servers or NAS storage devices. This command analyzes all network shares in all servers on the network. 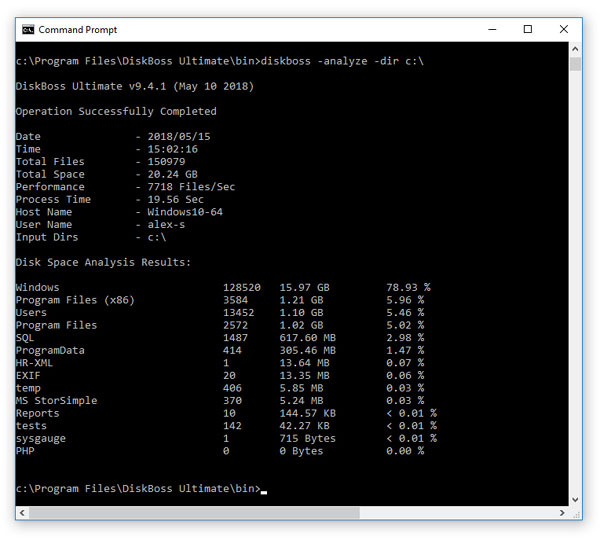 This command executes a user-defined disk space analysis command. This command classifies files in the specified disks, directories or network shares. This command classifies files in all network shares in the specified servers. This command classifies files in all network shares in all servers on the network. This command executes the specified user-defined file classification command. This command searches duplicate files in the specified disks, directories or network shares. This command searches duplicate files in all network shares in the specified servers. This command searches duplicate files in all network shares in all servers on the network. This command executes the specified user-defined duplicate files search command. This command searches files using the specified file wildcard. This command searches files in all network shares in the specified servers. This command searches files in all network shares in all servers on the network. This command searches files using the specified regular expression. This command executes XML search queries defined according to the DiskBoss XML-Based format using input directories and files specified in the command line. For detailed information about the XML format, please refer to the DiskBoss XML format specification. This command executes a user-defined file search operation pre-configured using the DiskBoss GUI application or imported from an XML file. This parameter specifies the list of input disks or directories to process. In order to ensure proper parsing of input disks and directories, directories containing space characters should be double quoted. By default, DiskBoss generates combined reports showing information about all processed disks, directories or network shares. In order to generate an individual report for each input directory use the '-batch' command line option to enable the batch report generation mode. This parameter specifies the list of host names or IP addresses of servers or NAS storage devices that should be processed. DiskBoss will enumerate all network shares accessible in the specified servers or NAS storage devices, perform the required operation and generate reports if required. By default, DiskBoss generates combined reports showing information about all processed network shares. In order to generate an individual report for each network share use the '-batch' command line option to enable the batch report generation mode. In the network-wide operation mode, DiskBoss will discover servers and NAS storage devices accessible on the network, enumerate all network shares available in all detected servers and NAS storage devices, perform the requested operation and generate reports if required. By default, DiskBoss generates combined reports showing information about all processed network shares. In order to generate an individual report for each network share use the '-batch' command line option to enable the batch report generation mode. This option specifies the list of directories that should be excluded from the operation. In order to ensure proper parsing of command line arguments, directories containing space characters should be double quoted. This option saves results to an SQL Database using the ODBC interface configured in the DiskBoss GUI application options dialog. This option sets a custom report title. This option sets a custom report label. This option sets the maximum number of file system hierarchy levels for disk space analysis operations and the maximum number of file class hierarchy levels for file classification operations. This option sets the maximum number of files (or subdirectories) per directory (default is 20) for disk space analysis operations. This option sets the maximum number of files per class (default is 20) for file classification operations. This option instructs to save compressed disk space analysis reports. This option enables the batch report generation mode. In the batch report generation mode DiskBoss saves an individual report file for each input disk, directory or network share. This option shows the product's major and minor versions. This option shows the command line usage information.